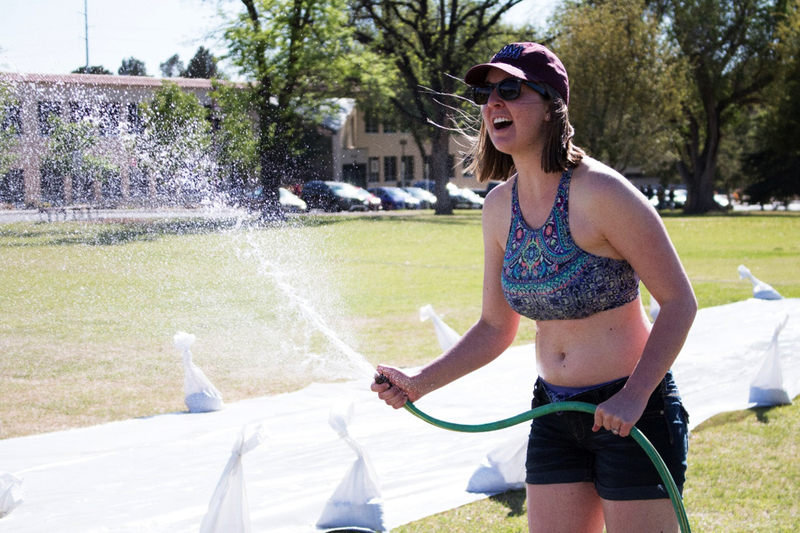 NMSU students showed up on the Horseshoe in their trunks and swim suits last Thursday, April 5, and slid on a giant slip and slide. The slip and slide was part of a preliminary fundraising event held in advance of the upcoming Relay for Life. 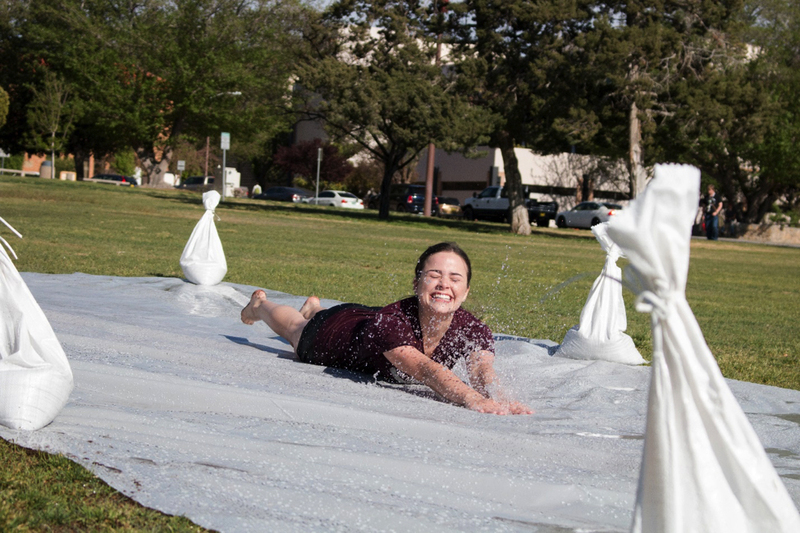 The NMSU chapter of the American Institute of Chemical Engineers (AIChE) put on the slip and slide event and will host the Relay for Life as well. The actual Relay for Life event will kick off Friday, April 13, on the Horseshoe at 6 p.m. The Relay for Life is a part of a nationwide cancer fundraising campaign. Relays take place on either a track or designated course. Team members take turns walking so that each team has a member on the track or course at all times to signify that cancer never sleeps. Tomorrow’s relay at NMSU will run throughout the night and is scheduled to finish at 6 a.m. Saturday morning. As for the organization hosting these events, AIChE is a club that contributes to the Chemical Engineering Department at New Mexico State University through numerous activities involving faculty, university student members, and students of all ages from kindergarten through grade 12. 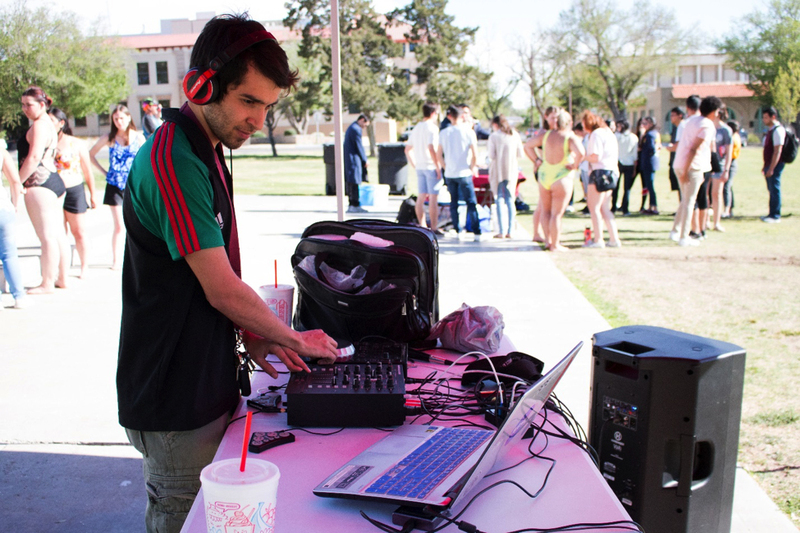 NMSU student and Relay for Life organizer Antonio Lopez provides some background on the event and shares how the loss of his grandfather to cancer in 2017 led to him getting involved in helping to put on this year’s Relay for Life at NMSU. (Brandon Mangum/Kokopelli)It’s also a club that promotes community service and personal development by offering chemical engineering students the opportunity to be a part of something greater than themselves. “It is a club for all the chemical engineers that want to be a part of a family. It allows you to be with fellow chemical engineering students who are willing to help you out and gives you the opportunity to be a part of social groups and get in contact with professionals for your future career,” said Ivana Romero, a member of the NMSU AIChE chapter. AIChE members put a lot of planning into last Thursday’s event as they set up two giant slip and slides, each ten feet by 100 feet. Students were able to slide an unlimited number of times for five dollars or one time for one dollar. AIChE also made liquid nitrogen ice cream to sell and hired a DJ to provide musical entertainment. Many who came out indicated they wanted to support a good cause. 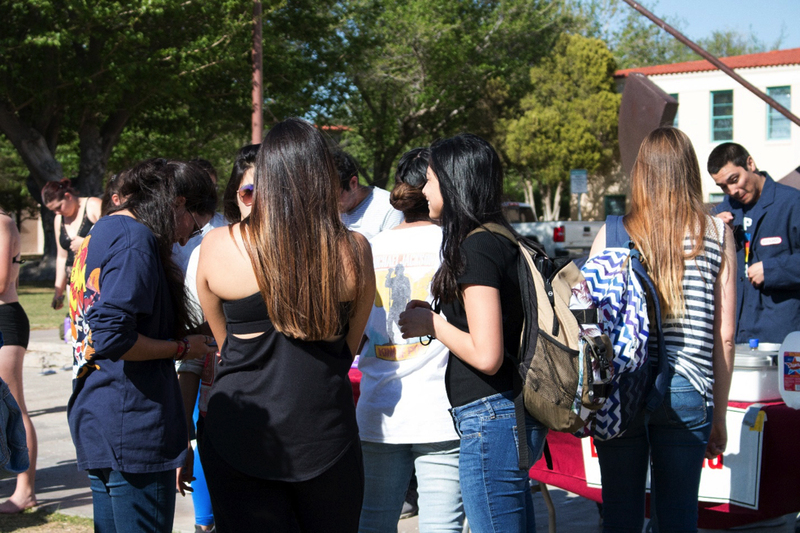 “I have family members and friends who have either passed or are survivors of cancer so I came out to the event because I want to help raise money for cancer and because I am going to be a part of the Relay for Life event,” said NMSU student Mikayla Olsen. As for the proceeds, the Relay for Life foundation is getting one hundred percent of the money that was raised. “The proceeds are all going towards cancer research. 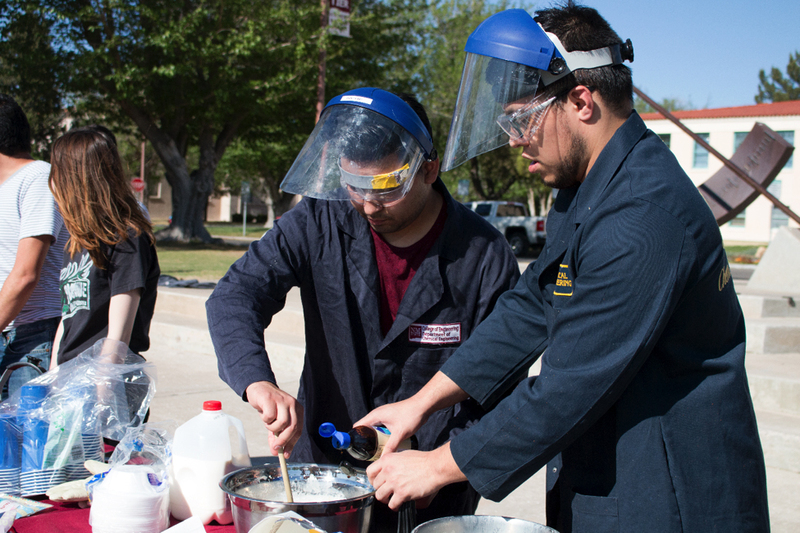 We’re not taking a dime,” said Sicilee Macklin, president of the NMSU AIChE chapter. There are a number of different parts to Friday’s Relay for Life event. First, all event participants are recognized. Second, the survivor lap begins. This is where survivors and people currently battling cancer get to walk and be cheered on and supported by all in attendance. Third, the caregiver lap begins. This is where those who have provided care to their loved ones affected by cancer get recognized while walking. After the caregiver lap, teams begin to pour onto the track to begin the celebration. Team members take turns walking on the track which symbolizes the ongoing fight against cancer. When team members are not walking, they have the opportunity to visit team campsites and participate in games, activities and entertainment while also learning how to be a better public supporter for the American Cancer Society. Later, after sunset, luminarias are lit to remember those who have been lost to cancer and to show those who are affected by cancer that they are not alone. Finally, closing ceremonies conclude the event. This is when volunteers who helped with the event are recognized for their hard work, and participants are reminded that Relay for Life events will continue until cancer is no more. If you’re looking to be a part of one of these events, check out the Relay for Life website to find an event near you.